Big Leather Couch: R.I.P. - "The Voice Of God"
R.I.P. - "The Voice Of God"
This week, two important figures within the NY Yankee family passed away; in one case leaving a void which will never be filled and in the other leaving a legacy of success and failure. Today, I want to share with you, the story of "The Voice Of God", as he was dubbed by Mr. Reggie Jackson. Mr. Sheppard was born in 1910, though he never revealed his real age throughout his life. Born in Richmond Hill, a section of the borough of Queens, New York City Sheppard served as a U.S. Naval Officer in World War II. Lt. Sheppard commanded shipboard gunnery crews in the United States Pacific Fleet (1942–1945). He graduated from Saint John's Preparatory School in Bedford-Stuyvesant, Brooklyn in 1928, and graduated from St. John's University in 1932, where he was president of his senior class. Sheppard was enshrined in the St. John's University Sports Hall of Fame, where he earned seven varsity letters from 1928 to 1932, three in baseball as the starting first baseman and four in football as the starting quarterback. He earned his Master's degree from Columbia University in 1933. Sheppard was originally a speech teacher at John Adams High School and later he held a similar position at his alma mater, St. John's. He was speech and debate coach for Sacred Heart Academy's Forensic Team in Hempstead, New York. Sheppard would continue to serve St. John's as a PA announcer for sporting events, including men's basketball and varsity football, into the 1990s. Sheppard maintained that his work as a professor of speech was far more important than his work as an announcer. He said that as an announcer, "All I have to recommend is longevity." Mr. Sheppard debuted as Yankee PA announcer on April 17, 1951, with the Yankees' home opener, a win over the Boston Red Sox. In 1956, when the New York Giants football team moved into Yankee Stadium, he began announcing their games as well, staying with them for their move into Giants Stadium. Sheppard made a rare professional flub during the Giants' first home game in New Jersey, telling the crowd, "Welcome to Yankee Stadium." Mr. Sheppard retired from working for the NY Giants after the 2005 season as the commute from his home on Long Island to Giants Stadium in NJ was too tiring for him. His last game worked for the NY Yankees was in 2007. he did not do the League Championship series that year. Though he was expected back in 2008, it never came to be and he even missed the All-Star game at Yankee Stadium that year. His next scheduled appearance was to be the final game in the old Yankee Stadium, but two days before he cancelled, though he did record both line-ups to be used for the game that evening. Sheppard officially announced his retirement as the Yankees' public address announcer, telling MLB.com, "I have no plans of coming back. Time has passed me by, I think. I had a good run for it. I enjoyed doing what I did. I don't think, at my age, I'm going to suddenly regain the stamina that is really needed if you do the job and do it well." Unlike many of the stadium announcers of today, Mr. Sheppard's announcements were not grandiose and blaring. Inf act, Mr. Sheppard once said "A P.A. announcer is not a cheerleader, or a circus barker, or a hometown screecher". "He's a reporter." Before a player's first at-bat, Sheppard announced his position, uniform number, name, and number again. For each following at-bat, Sheppard announced only the position and name. He did not use nicknames, when Oil Can Boyle pitched he was introduced as Dennis Boyd. (In the 2nd video linked below, this statement is disputed, but I do remember it). 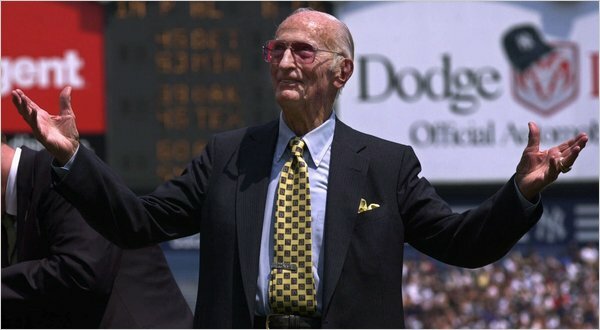 To this day, Mr. Sheppard's voice is still heard at least three times every game at Yankee Stadium and that is when Derek Jeter's times at bat come. "Players changed year in and year out, he was the one constant," Jeter said. "Every time you heard it, you got chills." Jeter reiterated his desire to have only Bob Sheppard announce him into games and it shall be so as long as Jeter is a Yankee. In a special tribute to Sheppard, Major League Baseball will have Sheppard's recorded voice introduce Jeter during Tuesday's All-Star Game last night. In typical Sheppard fashion, upon hearing this request from Jeter, he responded, "It has been one of the greatest compliments I have received in my career of announcing. The fact that he wanted my voice every time he came to bat is a credit to his good judgment and my humility." 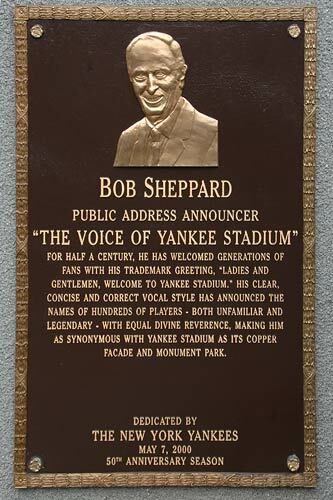 On May 7, 2000,the Yankees honored him with "Bob Sheppard Day" and put a plaque in his honor in Monument Park. Fans gave Sheppard a standing ovation, and ome old-timers stood on the field. Walter Cronkite read the plaque to the crowd that day. "The voice of Yankee Stadium," read the plaque. "For half a century, he has welcomed generations of fans with his trademark greeting, 'Ladies and gentlemen, welcome to Yankee Stadium." He announced at 62 World Series games and a pair of All-Star Games, and introduced more than 70 Hall of Famers across his career. "A voice that you hear in your dreams, in your sleep," Braves third baseman Chipper Jones said Sunday. "Today's a sad day." While few might have recognized Sheppard in person, his voice was unmistakable. Once, while ordering a Scotch and soda at a bar, Sheppard watched as heads turned his way. He often read at Mass, and was subsequently greeted by parishioners noting he sounded exactly like the announcer at Yankee Stadium ..."I am," he would reply. How about your first day on the job and you get to introduce legends. In fact, the first batter he ever announced was a DiMaggio, but it was Dom DiMaggio, the center fielder for the Red Sox. The Yankees' lineup included five Hall of Famers: Mantle, Joe DiMaggio, Berra, Mize and Rizzuto; the Sox had three more, Williams, Bobby Doerr and Lou Boudreau. In addition to his wife, Mary, Mr. Sheppard is survived by sons Paul and Christopher, daughters Barbara and Mary, four grandchildren and at least nine great-grandchildren. A wake will be held Tuesday and Wednesday, with the funeral Thursday in Baldwin. As a fan who spent more games at The Stadium then I can remember, it still gives me chills to think about and hear that voice in my head. Any young kid who wanted to be a Yankee when they grew up would try and imitate that great voice and cadence..."Now batting...Second base...number 8...Vinny Marini...number 8"
Now Heaven has their announcer when roll call is taken...Thank you Sir, for making my experiences at the ballpark so much more memorable. If you have never heard Mr. Sheppard, please CHECK OUT THIS VIDEO STORY. Bob Sheppard was, in my humble opinion, easily one of the best public-address announcers in sports history. Maybe the best. Without embellishment...that's what I respect. His voice resonated, and all he did was tell us the position, the number, and the name. That's all anyone needs to know. Baseball is a pastoral game and Mr Sheppard let it be what it is. Rest in peace, Mr Sheppard. I have never been a Yankee fan but I am happy good people have been involved in sports for so many years. Yes, he was one of the greats, indeed. I listened to an interview with him on NPR the other day and he said that one of the things he prided himself on the most is that if you didn't know him you would never know what team he favored when he was working. That was very true. How odd is it that Steinbrenner died yesterday, too.